There’s a lot to appreciate. “I have the two best jobs in the world, being a mom and a coach,” said Schuller, who leads a winning basketball program at Eastern Washington while raising three children with husband Mark. Viewed from another perspective, Schuller also runs a winning household while helping raise dozens of young women to succeed outside the basketball court. They text Schuller almost every day, sharing stories of love, career and, yes, motherhood. One of her favorites arrived last week. Schuller’s phone lit up with a message from 2016 graduate Hayley Hodgins, who was just named girls basketball coach at Richland High School. “That was a real mom moment for me. She’s going to do a fabulous job, I just know it,” Schuller said of Hodgins, the leading scorer in school history and a top student as well. Then again, so are most of Schuller’s players. For five straight years, her teams have scored a perfect 1000 in the NCAA’s Academic Progress Report. Indeed, female empowerment helps nourish this tree, at home and on the court. Schuller’s role model is her mother Eileen, an attorney and Air Force wife who raised three daughters. Eileen was multitasking before the word was coined. “She had a pretty full plate,” said Schuller, who was looking forward to seeing her mother fly up from California for Mother’s Day. Most weekday mornings, the Schuller family is working against the full-court press of the clock. Husband Mark, the Cheney city administrator, makes sandwiches and hustles out the door at 7:15 to drive daughter Megan to jazz band practice at Cheney Middle School. Meanwhile, elder son Rory heads to Cheney High School while Schuller takes 6-year-old Brandon to Salnave Elementary. Then Schuller joins her other family at Eastern, where’s she’s been head coach since 2001. The Eagles are pretty good on the court, too, averaging 20 wins over the past three years. Just last month, Schuller was rewarded with a new five-year contract. Winning is its own reward, but not the biggest. Bonding with her players comes easily for Schuller, especially during road trips in the far-flung Big Sky Conference. That’s when Mark does the heavy lifting at home. “I’ve grown to appreciate what single parents have to go through,” said Mark, who played baseball at Ohio State. Now he’s making dinner while Rory sets up the iPad to watch the Eagles. The Schuller teens always step up. Rory plays basketball and baseball at Cheney High, but drives Megan home from practices for three different sports. 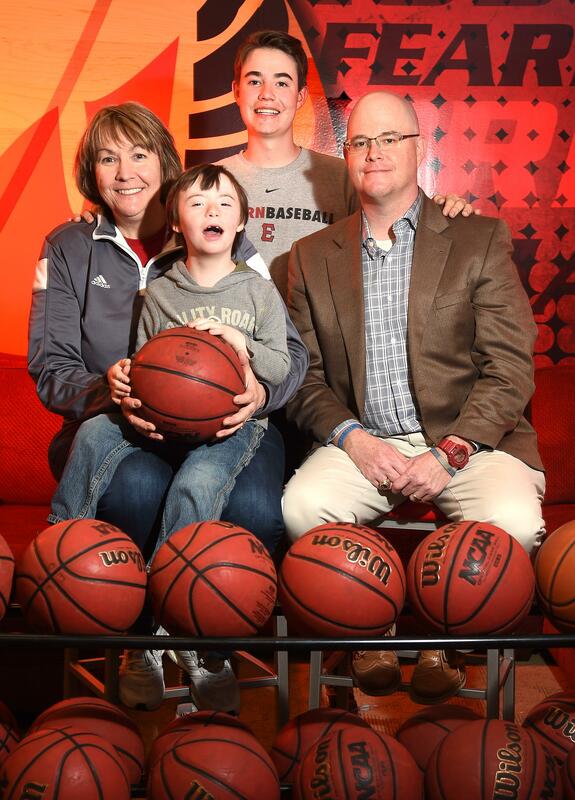 Back home, both spend time with Brandon, who has Down syndrome. “They’re both very helpful with Brandon – we have no qualms about leaving them alone,” said Mark. The Schullers’ support network is even bigger than that. Mark said he’s thankful that Cheney mayor Tom Trulove is “one of the biggest fans of the program” and cuts him some slack during the hectic times. Wendy appreciates the backing of athletic director Bill Chaves and her assistant coaches, who helped her through a difficult birth with Brandon. “That’s what makes Eastern such a special place,” she said. As the Schullers gather around the iPad for road games, Wendy’s image shows on the tiny screen. Brandon gives a cheer. “He’s starting to figure out that mom is on TV,” Mark said. Home games are a family affair. The Schullers gather at Reese Court to cheer the Eagles; it’s a welcome blurring of Wendy’s two families, as Brandon greets the players afterward. After games, the front door of the Schuller house is Wendy’s gateway from coach to mom – sort of. Decompression doesn’t come easily, especially after a loss. Wendy interrupts. “It’s usually him that’s more upset,” she says. Freuquent during and after the season, Wendy’s two families mingle at their home. Dinners and TV sessions are all part of a coach-mom’s life. “I hope my players see that they can do all of those things,” Schuller said. Published: May 14, 2017, 6 a.m.